Remember when the critics projected that the Oregon Ducks men’s basketball team would finish eighth in the Pac-12 this season? And remember when they also said that this would be a down year for Oregon? Well, the season isn’t quite over yet, but if you squint and take a look at the standings, the Ducks are currently eight games over .500 and they also have a winning record in Pac-12 play. With 11 conference games left on the schedule, anything can happen; however, there’s no doubt that Dana Altman‘s highflying Ducks have exceeded their low expectations. Offense has never been a problem for the Ducks; they have always found ways to score. Oregon currently leads the Pac-12 in points per game, assists per game, 3-point field goals made, and free-throw percentage. Yeah, like I said, the Ducks have no problem scoring the basketball; however, while the Ducks may be a fine-tuned machine offensively, things start to change on the other end. Oregon gives up about 70 points per game, which is second to last in the Pac-12, and the Ducks have struggled to play consistent defense all season long. Whether it’s missing rotations, lack of communication, or allowing too much penetration, the Ducks Achilles heel this season has been their defense, but, surprisingly, they still sit near the top of the Pac-12 conference. 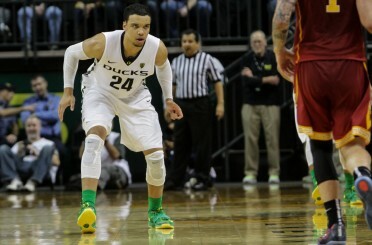 Freshman forward Dillon Brooks has been a pleasant surprise this season. So, with that being said, what do the Ducks have to do to maintain momentum and finish strong? Joseph Young must continue leading the way: It’s no secret that the Ducks’ leading scorer is also their best player. And after Oregon lost its starting point guard and small forward during the offseason, two things were certain: Young was going to be the new leader of this team and Oregon’s new and inexperienced players were going to have to grow up quickly. To this point of the season, Young has taken the leadership role in full stride. He’s embraced the spotlight, but he’s also done a great job of leading his teammates. 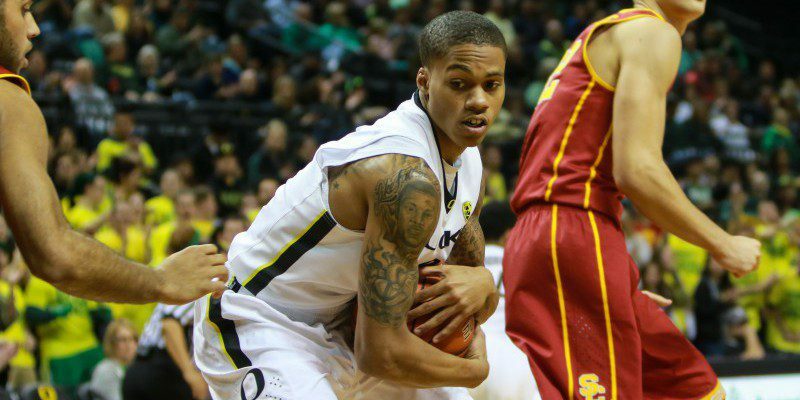 Young, who is second in the Pac-12 in scoring this season, is the motor that starts this Oregon Duck team. The Ducks normally play well when their leading scorer plays well, but on the flip side, Oregon typically struggles when Young can’t get it going. While relying heavily on one player isn’t necessarily a great recipe for success, the Ducks have to continue with what has worked so far. Young is averaging 19.3 points, 4.8 rebounds and 3.5 assists per game, which are all career highs. If Young continues to produce, the Ducks will remain competitive. The baby ducks have to continue developing: Like I stated above, Oregon brought in a plethora of new players and transfers. Players like Dillon Brooks, Ahmaad Rorie, Casey Benson, Jordan Bell, and Dwayne Benjamin have all seen significant playing time, and while most coaches tend to bring new players along slowly, coach Altman was forced to play the youngsters right away. Fortunately for the Ducks, it’s worked out, well, most of the time. Despite the fact that some of Oregon’s new players still make rookie mistakes, their speedy development has been one of the main reasons why the Ducks have exceeded expectations. Brooks is averaging 13 points and nearly five rebounds per game. Also, Benjamin is averaging eight points and five rebounds. But one of the most pleasant surprises this season has been the emergence of Bell. The athletic big man has been the Ducks’ much-needed defensive anchor and his presence on the floor has made a huge difference. The freshman is averaging nearly six points, seven rebounds, and almost four blocks per game, and in just his first season, Bell has set a new single season record for blocks. Of course, the young guys still have a lot to learn, but if they can keep improving, the Ducks will have a chance to finish strong. D-E-F-E-N-S-E: What does that spell? Oh yeah, it spells defense. This last point is simple, but it’s easier said than done, obviously. If the Ducks want to maintain the momentum that they have built throughout the first 20 games of season, they must find a way to play hard-nosed defense on a consistent basis. It all boils down to simple defensive principles. If Oregon can communicate, rotate, and win the rebounding battles, that should be enough to come out victorious against the majority of the teams in the Pac-12. You can only outscore teams for so long; offense comes and goes, but you can always control how hard you play on the defensive end. You know what they say: defense wins championships. There’s no doubt that this Oregon team has been a lot of fun to watch, and there shouldn’t be a reason why it can’t continue winning. These highflying Ducks control their own destiny.